My needles have been on fire this week, or at least it feels like it. I finished the mitts and am quite pleased with them. Now all I need is some very brisk cold air to go along with them. I am thrilled that they match many of my other accessories in my closet. So what am I knitting? I finished the one sock up there in the photo. The socks are for my dad for Christmas and I have only to knit the second sock to match, easy peasy. I've cast on and believe me I am motivated to get these socks out of the knitting bag. My pink cardigan has seen some knitting as well. I am knitting on dpns for a variety of reasons, one because I do not own a circular needle small enough (too cheap to buy) and I really do not like magic loop or two circulars....I know. I am being stubborn and opinionated, but these dpns work for me and I get the job done. It is only fiddly for about three rows then my mind and hands accept the fiddliness and the knitting becomes even and smooth and happy. I have romantic visions of finishing both projects by next week......let's see if it becomes reality-nothing wrong with goal setting is there? My reading is the same. The Hotel on the Corner of Bitter and Sweet is engaging and a nice read before bed. I do love when the author flips from present time to the past. I think it is one of my favorite ways to read a story and piece together a plot. Very nice cardi - Pretty colour. Nothing at all wrong with goal setting - Hope you make it. Good luck! Nothing like a Yarn Along to give you the impetus to get projects completed, I find :) Well done on the socks, so nice to get presents done early! I really do love your cardigan Karen. 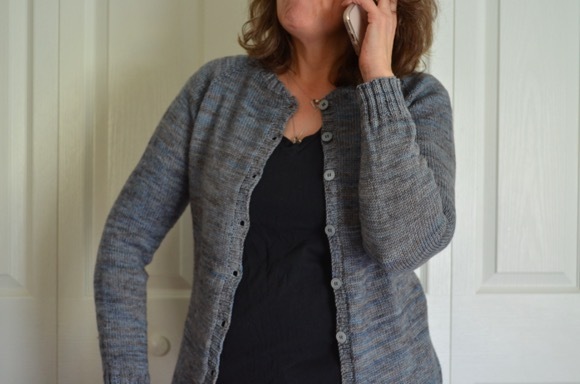 I know what you are saying about the dpn's and I held off for so long, but with eight cardigans [now seven] to complete by Christmas I needed to move a little faster so finally broke down and bought a smaller circular. I don't get it, but I really don't like knitting sleeves, they take forever! I stayed up until 1 a.m. last night finishing my grey Annabel and getting it blocked. Now to wind more yarn for the next one. I figure whatever works ;-) It's not being stubborn but knowing what feels best and gives yoy the best results. Good luck with finishing, I think you can do it. I've missed the last 2 yarn alongs but I see you have been very busy!! I love the wool you used for the mitts....that pattern is in my favs too! Good for you getting Christmas presents completed....I wish I could say the same! Looking forward to seeing your cardigan all finished up!! Happy knitting!! I love the yarn of your pink cardigan, so wonderfully vibrant. Also, the mitts look fab, I meant to comment on them yesterday! Love love love the new banner!!!! so seasonally beautiful!!! and of course, all the knitting is fab, too!!! can't wait to see that cardi!! It always amazes me how fast you knit! Of course you'll finish the cardigan. Love the new photos in the banner. Wow- you have been on fire. My mom recommended that book to me.... eager to see what you think of it. I love the pink - and I'm with you on DPN's. I need them to knit the sleeves on a sweater but they're in use on some mittens right now. Too cheap to buy more and too lazy to learn another way to do it. You are amazing! I'm in awe at how fast you knit :) I am still in love with that pink and since we are finally falling into a routine over here I might have some time to pick up a book or two :) Hope your week is lovely. Your new blog header is gorgeous my dear! You have to do whatever works for you. Go go go, you can finish them! :) The cardigan is so bright and cheerful! That's a beautiful pink yarn. I love magic loop, dpns not so much. Whatever works. Hotel on the Corner... is on my fall reading list. 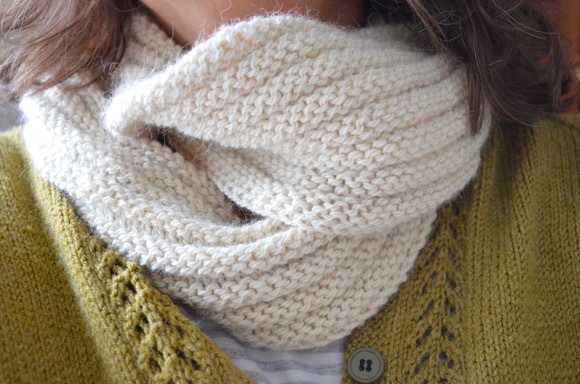 Beautiful knits and I love your new header. I love your new blog header/photos! When it rains it pours! Glad you've been on such a knitting roll! Still totally in love with that pink! Man, I wish I had that many projects going here! It's pouring in other areas of my life unfortunately, like repairs! Your knits are gorgeous and I love the mitts! love that pink! i think i should make some sock for my dad too... let us know how you like this pattern. Between you and Tracey, I feel so lazy! You girls rock on the knitting front...who am I kidding, you just rock! Can't wait to see the finished cardi! Glad to hear you're liking the book! That pink is so pretty. Did you tell somewhere what yarn it is? Nice socks, too; I'll bet your dad will be pleased. I also like your new header. How'd you arrange the photos like that? BTW, I just noticed that you live in PA; my DH grew up there! I used Picasa photo editing, which is free to down load and use. I really like the gray and the new header. What a lovely new banner, and lovely knitting! I wish my needles were on fire too! Your book sounds lovely and comforting - perfect for autumn reading under the duvet before bedtime. Hope your romantic visions are fulfilled. and me? I actually got the yarn to make an Anabel sweater at last. I bought some Lopi Icelanding wool and started making it straight away...I'm so enjoying knitting it and reading two new to me knitting books. I hope you manage to get lots of knitting done over the weekend. I really enjoyed Bitter and Sweet. Good luck on your socks... and I can't wait to see your finished sweater! Knit faster!! I love the pink cardigan. Beautiful color. I have seen the book you are reading and been tempted to pick it up. On you recommendation, I think I will next time I see it! Thanks and enjoy the rest of your week. That pink cardie is going to be so cheerful this autumn!